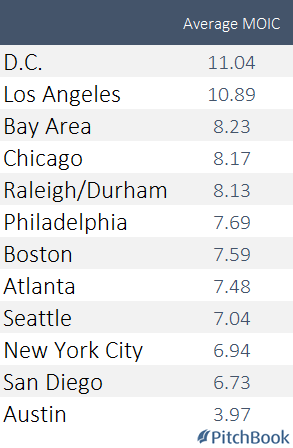 Which US cities generate the best VC returns? Although the Bay Area undeniably holds the crown for the most active startup locale, there are many other vibrant communities throughout the U.S. with founders creating game-changing companies. Cities like Austin, Boston, New York and Seattle immediately come to mind, all fostering growing startups, as well as venture firms to back them. But how do these cities rank against each other? A version of this question was recently answered by Fred Wilson of USV. In his post “Second and Third Tier Markets and Beyond," Wilson separates a handful of notable startup communities into tiers based upon their respective startup activity and startup funding activity. The Bay Area took its expected place at the top of the chain at tier one, followed by NYC, Los Angeles and Boston in tier two, and Seattle, Chicago, Atlanta and Washington, D.C., making up the third tier. After reading through conversations sparked by this post, we wondered: How do different startup communities stack up on a success/returns multiple basis? Using data from the PitchBook Platform, we calculated return multiples for some of the more prolific startup communities throughout the U.S. and have included our findings below. Updated note: The average MOIC table displays averages of all MOIC for exits that meet the above criteria, including sub 1x exits. The first two charts only include companies that have confirmed exit amounts and multiples 1x and above, which will cause the data to be skewed positively, as successful exits are more likely to be reported than smaller ones. The results are a bit surprising, with cities like Washington, D.C., and Chicago ranking ahead of the Bay Area and NYC. That said, there are many ways to cut the data that may give alternative results. What are other metrics you think can be used to judge the successfulness of a startup community? We'd love to hear your thoughts, so drop us a comment below with any ideas or suggestions and we'll try and include them in future articles.